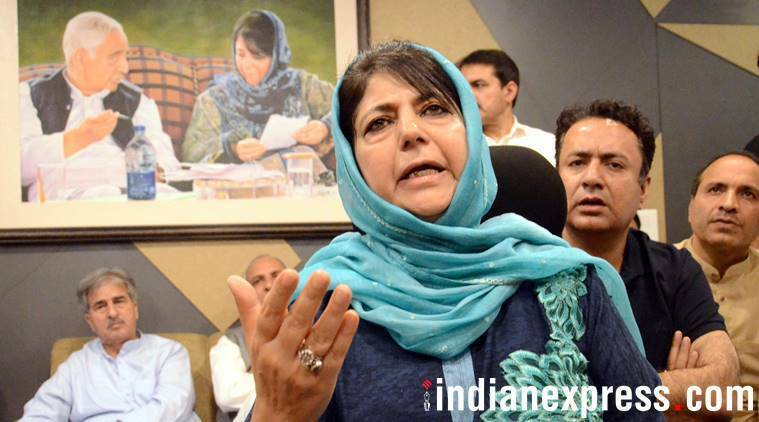 Former Jammu and Kashmir chief minister Mehbooba Mufti on Saturday reminded Union Finance Minister Arun Jaitley that the Indian Constitution extended to the state through Article 370, and that removing the guarantees provided in the Constitution would “force us to reconsider whether we would like to continue with you or not”. Jaitley, she said, needed to understand “that this is not easy, and if you remove Article 370, your connect with J&K is also over”. On Friday, National Conference vice-president Omar Abdullah had questioned Jaitley’s assertion that Article 35A has been “hurting” the interests of the common people by blocking the economic development of J&K. He had said that J&K was a part of India “based on this special status”. “It is absolutely wrong to create this perception that the issues of the state are because of 35A. This state is part of the country based on this special status,” he had said. Senior PDP leader Naeem Akhtar has accused the BJP of trying to convert the constitutional relationship between J&K and the Union “into an occupation through subterfuge and systemic subversion”.